Hubway, Boston’s popular bike share program, launched its fourth season earlier this month. Four years shows a lot of ground covered for the program. Hubway was launched on July 28, 2011, as a partnership between the City of Boston and Alta Bicycle Share, with 600 bikes at 60 rental stations. The program has been a big success and this season, riders will share 1,300 bikes at 140 bike rental stations in Boston, Cambridge, Somerville and Brookline. The program hit the 1,500,000-rider mark last Thanksgiving, then closed out 2013 with nearly 10,000 annual subscribers (and that’s not counting the short-term memberships). In the past, Boston split both operating costs and profits with Alta Bicycle Share. Boston paid for its share using private sponsorships and public grant money. But Boston is now venturing out on its own. Under a new contract, Boston will fund all operating costs and pay Alta Bicycle Share for services. The city will buy all services for a lower rate, about 30 percent less. For each bike dock, this translates into about $70 per month for maintenance and operations. This is lower than other U.S. programs, such as the Capital Bikeshare in Washington D.C., which pays $111 per bike dock. This is good news and comes at a time when other cities are struggling to pay the bills for their bike shares. Montreal’s bike-share program filed for bankruptcy in January and New York City’s bike program recently asked officials for millions of dollars in aid. In addition to seeking public grants and private sponsorship, Boston has kept costs down by closing bike racks for the winter. However, this past winter, Cambridge sites were kept open as a pilot test program. Cambridge. 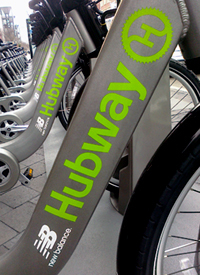 The city kept Hubway racks open throughout this winter, as part of a pilot program. The system saw an average of 2,000 Hubway trips per week, with no injuries or incidents reported. Six new stations are expected to open this season. Boston. Ten new Hubway stations are expected in Jamaica Plain and Dorchester this year. Boston bike helmets. The program asks all riders to agree to wear helmets in their rental contract and has partnered with city businesses to offer subsidized helmets in the past. Last fall, it tested the first bike helmet vending machine in Back Bay, on the corners of Boylston and Massachusetts Avenue. The vending machine holds three dozen helmets and accepts returns. Bike helmets are required for cyclists age 16 and under in Massachusetts. In addition to requiring use for Hubway cyclists, Boston city officials have discussed the possibility of passing a local law mandating use by all cyclists to protect riders from the risk of long-term head injuries in bicycle accidents. Brookline. The city will re-open the same four stations in Coolidge Corner, Washington Square and Brookline Village. Somerville. Somerville will open 12 stations this year. One change is the Ball Square station will be moved to Magoun Square. This is National Bike Month, when cyclists gather for events and rides all over the country. In Massachusetts, the busiest time is during Bay State Bike Week, which began last weekend. Cyclists from Boston to Springfield to Cape Cod are being encouraged to pedal to and from work in the name of fitness and reducing traffic congestion on the roads. But along with the fun, Bike Month is a time to ask ourselves and lawmakers if we can make the roads safer to prevent personal injury to bicyclists. Safe Passing Law. Adopt a safe passing law with a minimum distance of three feet to address bicycle safety. Vulnerable Road User. Adopt a vulnerable road user law that increases penalties for motorists that injuries or kill bicyclists or pedestrians. Cell Phone Ban for Drivers. Pass a cell phone ban for all drivers. Currently, Massachusetts bans all drivers from texting while driving but only bans drivers under 18 from talking on their cell phones and driving. Bicycle Riders Manual. 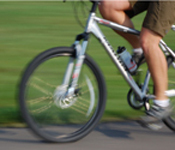 Create a statewide bicycle riders manual with laws, state bike routes and laws for cyclists. MassBike, the state’s leading advocacy group for cyclists, has been seeking passage of a vulnerable road users bill that increases penalties for drivers who injure or kill a bicyclist or others defined as a vulnerable road user. MassBike first filed a bill with the Massachusetts Legislature in 2011 and refiled a few months ago for the start of the new legislative session. Under the bill, drivers found guilty of crimes such as motor vehicle homicide or hurting or killing a person while driving drunk would face double the normal fines if the victim is considered a vulnerable road user. Additionally, the bill would require violators to take a traffic class and perform 100 hours of community service related to road safety. There would be special penalties for drivers who harass vulnerable users with their vehicles. Meanwhile, victims would be given guidelines for filing civil lawsuits against drivers who assault or threaten them. Another bill proposed by MassBike is the Bicycle Lane Bill, which would make it a violation for a car to park or stand in a marked bike lane. Boston and some other communities have bans, but MassBike seeks a statewide ban. Read about other bills filed and supported by MassBike. Bay State Bike Week starts Monday, May 14 and runs through Sunday, May 20. The annual celebration features several days of activities and educational programs throughout Massachusetts. Each year, one of the most anticipated events is the MassCommute Bicycle Challenge. For this one week, employees, students and others participate in teams to see who can pedal the most miles in the name of reducing traffic congestion, helping the environment and making time for fitness. Click the above link for information on how to participate. One event to watch this year is the Massachusetts Bike/Walk Summit on Thursday, May 17 at the State House. The event is co-sponsored by MassBike and WalkBoston, which seek to pass the Vulnerable Road Users Bill. If passed, the bill would increase fines for motorists who kill or injure vulnerable users. The term “Vulnerable Road Users” would include pedestrians, a person operating a bicycle, handcycle, tricycle, skateboard, roller skates, in-line skates or non-motorized scooter. The bill was filed in January 2011 and is now in the Joint Committee on Transportation. MassBike has until June 1 to persuade legislators to advance the bill. The bill is supported by WalkBoston, Massachusetts Public Health Association, Conservation Law Foundation, Boston Cyclists Union, and Transportation for Massachusetts. Click the above link for information on how to participate. Bay State Bike Week will feature events and activities for all ages throughout the state, from Boston to Worcester to western Massachusetts. Most events are open to the public for free and are a great opportunity to learn more about cycling and the growing opportunities in Massachusetts. Click the above link for the full calendar. Bicyclists have returned to the road in large numbers as Boston enjoys an unseasonably warm March. It is an optimal time for drivers to make sure they understand a bicyclist’s rights in Massachusetts and remind themselves to be vigilant when sharing the roadway. And for bicyclists, it is a good time to review the rules of the road. As drivers, we often watch out for other cars, but fail to do the same for pedestrians, motorcycles or bicyclists. In some bike accidents, drivers do not even see a bicyclist until just before the collision, and sometimes not at all. Other times, we may not understand the laws or are not focused on the road. Bicyclists are allowed to travel on the same roads as drivers (unless the road is a limited access highway) and must follow the same laws. Cyclists should generally ride on the right side of the road, but may use the full lane or the left lane when turning to the left, and cyclist may travel two abreast in the lane. They should not impede traffic. When drivers are turning left, they must yield right of way to any bicyclist. Cyclists are allowed to pass traffic on the right. Left turning motorists should be particularly aware at intersections where cyclists passing traffic on the right may be hidden from view. It is against the law for individuals to open a car door and interfere with the travel of a bicyclist. Drivers and passengers should turn and check for bicycle traffic before opening doors. 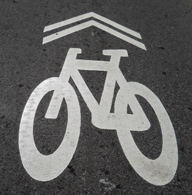 Divers can only pass a cyclist if there is sufficient room. It is illegal to cut bicyclists off after passing. The driver must wait until there is enough room to move back into the lane to avoid causing a bike accident. Cyclists are required to use hand signals to indicate their intention to turn, except when doing so may cause a bicycle accident (for example, when both hands are needed for braking). Cyclists have to stop at red lights and stop signs. They cannot ride the wrong way on one-way streets. Bicyclists should ride in the same direction as traffic in their lane. Bicycles should be equipped with reflectors and a warning device, such as a bell, and if ridden after dusk or before dawn, must be equipped with appropriate lighting. Bicycles cannot be ridden on the sidewalk in a business district. Towns may have additional ordinances about where bicycles can and cannot be ridden. Cooperation and common sense go a long way to preventing bicycle accidents. Cyclists should make themselves visible with bright, reflective clothing. Motorists should take the time to take a second look. Drivers and cyclists who have more questions can access information about Massachusetts bicycling laws and safety from MassBike. The Boston-based advocacy organization supports the development of bike-friendly infrastructure throughout the state and offers cycling education and safety programs. Heading back to school is always a big event, no matter how old a student is. Students look forward to meeting new teachers, starting new classes and being reunited with friends. Playgrounds. Each year, more than 200,000 children are treated in U.S. emergency rooms for falls on the playground. The goal is to implement preventative measures in your playground and make it as safe as possible if falls do occur. Start by inspecting playground equipment for any defective or broken parts.There should be a 12-inch depth of wood chips, mulch or sand. Mats should be made of safety-tested rubber or fiber material to prevent head injury if a child falls. Drawstrings on Jackets and Sweatshirts. Many pieces of fall clothing come with drawstrings. Most people think nothing of these until a child endangers himself or a classmate, often unknowingly. Prevent a dangerous situation where a child gets strangled. Remove drawstrings on hoods. Cut drawstrings from the waist or bottom of jackets, coats and sweatshirts to three inches. Loops on Window Blind Cords. Visit your child’s classroom to ensure it’s a safe environment. Look at the windows to see if they have blinds with a long cord. If there are blinds with cords, this is a safety hazard. A child could strangle himself when the teacher’s not looking or swallow the plastic piece at the end of the cord. Bikes. Many students ride their bicycles to school. It’s important for drivers to watch out for them, but parents also need to educate students on how to avoid bike accidents. The first rules is bike helmets. Massachusetts has a mandatory bike law for minors under 16. Beyond the law, bike helmets prevent and reduce head injuries should your child take a fall.